Belts conveyor shorter than 12 meters will be supplied in one section and complete. For lengths greater than 12 meters, the structure will be divided in two pieces, for greater than 24 meters, in three, etc. Each section will be connected using one or more unions. It will be built using bent sheet metal or rolled steel, with interior transverse bracing making a rigid, compact and resistant frame. When mentioned in the conveyors data sheets, the supporting structure will be quoted separately according to the drawing height. The supports include anchoring plates to fix them to the floor. The belt reinforcement will be textile, polyester and nylon construction. The number of layers and their breakage resistance will be indicated in their data sheet for each conveyor belt. The coating will be grease and oil resistant; the type of coating and thickness will be indicated in the data sheet. There will be a single vulcanize joint per conveyor belt. The stations will be made of one roller for flat belts, and three for trough belts. The rollers are bolted to the conveyor frame using slots, allowing an easy alignment during installation or maintenance. The troughing angle will be 20º/30º. In the loading zone, when indicated, the maximum distance between rollers will be of 300/330 mm. over a length of 1 meter, when the belt width is narrower than 1 meter. When the belt is wider than 1 meter, the maximum distance between rollers will be of 300 mm. for a distance equal to the belt width. For belts used for fines from rotary screens, the maximum distance between roller will be of 500 mm. The return idler roller will be formed by a single roller; its dimensions and fixing system will be similar to the rest of the rollers. The maximum distance between return idler rollers will be of 3000 mm. CARRIER ROLLERS, RETURN IDLER ROLLERS, AND DAMPERS. All the rollers, carrier and return, will comply with norm DIN.15207. The rollers will be manufactured in steel pipe with end prove caps, mounted over ball bearings, from well known brands, with life lubrication, dust and water proof using maze seals and retainers of the appropriate material. The diameters will be standard. Damper rollers will be installed when high loading impacts may exist. It will have conic surface of electro welded steel, and machined; key in to a steel shaft (F-114), supported by ball or roller bearings, dust and water proof, with grease lubricating system. When indicated, the surface of the hauling drum will be coated with a grooved rubber of quality and thickness to be defined in the data sheets. Also, when indicated, the metallic elements in the driving section, such as the drum, will be made of non-magnetic material. It will be formed by a electric motor-reducer with gears for relations smaller than 400 and planetary on higher relations. The electric motor is sized taking into account that the belts need to be started completely loaded. The protection will be IP-55, and the input voltage the same as the one from the power system, usually 380 V, threephase, 50 Hz. The speed reducer will be from a well known brand, such as TECNOTRANS, ROSI or similar, and it selection will be made according a minimum service factor of 1,4. The idler drum will be similar to the hauling one. The only difference is that it will not need the rubber coating. The belt tightening systems are spindle type, acting over the return drum. The spindle will be protected against dust and product falls. One adjustable scraper, formed by a steel plate, and a replaceable and adjustable hard rubber sheet over the outside face of the belt, right after the hauling drum. One V-shape scraper over the inside face of the return, right before the return idler drum. LOADING AND UNLOADING HOPPERS AND LOADING GUIDES. When indicated, a loading hopper will be installed, made of steal plate with the shape and dimensions indicated on the drawings. 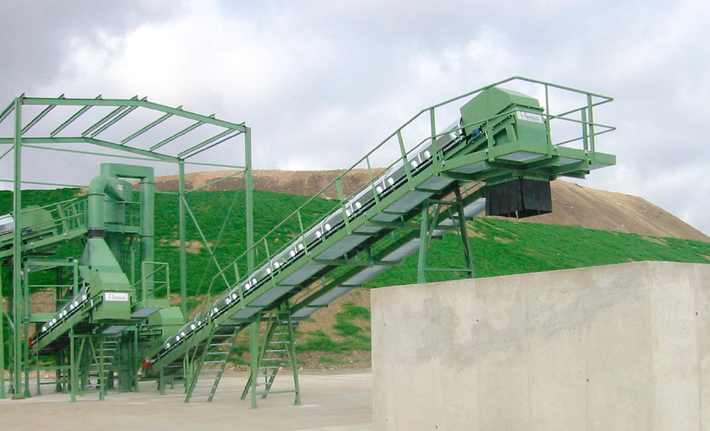 Also when needed, an unloading hopper will be installed, made of steal plate, forming a rigid assembly. All the rotary systems will have protections to prevent accidents, rigid enough to support accidental contact without any danger. When indicated on the Data Sheets, emergency stop pull-cables will be installed across the total length of the belt conveyor. The pull-cable will be made of steal with PVC coating and with a maximum length of 30 meters per section. It will be installed on each side that there is an access. All the safety switches and devices mentioned on the Data Sheets, will be quoted separately. Generally, it will not included with the belt conveyor. In case it is indicated on the Data Sheets, it will be quoted separately. The electric supply for the motors, will accomplish the standard voltage: 380 volts, three-phase at 50 Hz. The minimum protection for all the electric motors will be IP-55 with class F insulation. The surfaces for all the equipment and support structures, will be primed and painted according to the specifications described on the “Paint Specification Data Sheet”.